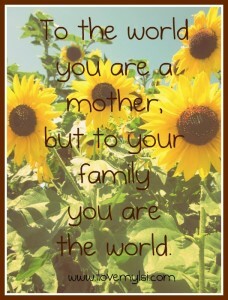 To your family, you are the world. I realize that not everyone has been privileged enough to have been raised by a fantastic mother or mother figure for that matter so I would just like to start off by apologizing if my words may feel hurtful to some. I do not mean to raise any feelings of pain. It’s just that I have an incredible mother and I feel the need to to gush about her today. Yes, I know that I am one of the lucky ones. I find that moms have some of the most fascinating life stories even when they don’t appear that way on the surface. My mother is no exception. She was born in a tiny little village in the middle of nowhere in Northern Greece. This is the kind of village where to this day, cows and goats account for most of the traffic on the road. Not a place where you would expect a now 72 year old woman to have come from, who still has the ability to stop conversation when she enters a room from the air of class she has about her. Today at lunch, we laughed for the umpteenth time about how this little girl with tight braids who worked in the fields from when she was a child, ultimately became a fashionista in the big city at the age of 18. At the age of 72, she has not changed one bit. She still gets her hair done once a week, her nails filled every month, and her eye is always on whatever looks divine. Apparently you can take the girl out of the village and you can also take the village out of the girl long term! When she moved to the city (Athens, Greece) at the age of 18, my mom got a job at a shoe factory. That is where she met my father who was a cobbler from the age of 12 until he retired at the age of 72. In her late 20s she left Greece, like so many others, and moved to Western Canada with my father in hopes of escaping the poverty of a post-WWII existence. She has recounted stories many times of her parents fleeing their village in the dark of the night with my mom, aunts, and uncles in tow to escape the terror of Nazi soldiers who were there to ransack their village among other inhumane acts. With $100 in her pocket and absolutely no knowledge of the English language, she left for a country on the other side of the planet which promised a better life – and that is exactly what it gave her. My mother was employed from the day that she arrived in Canada, as was my father. They both used their skills to work in a shoe store/shoe repair that their close friends (also immigrants who had gotten to Canada before them) owned. They both worked seven days a week and picked up other small jobs to make ends meet and later save enough money to buy both a small home and eventually the shoe store from their friend. By that time, my mother had given birth to both me and my sister. She worked every single day and kept us kids in a play area that they built in the back room of the shoe store. She always felt that she was lucky enough to have had the luxury to raise us and work at the same time without missing out on any time with us as we were growing up. It was ideal for both her and for us as kids. She also kept a spotless home which, to this day, I find awe-inspiring, and had food on the table every night for us to eat as a family. Looking back, I am flabbergasted. I could never figure out how my mother managed to do it all. As half of the parental unit, her impact was enormous on who I am today. She was a wife who made my father happy and proud until the day he passed away. She was and is a mother that raised two daughters who were afforded the luxury of a loving mom as a role model. Throughout the years, she has also managed to remain her own person within the context of our family. I’m very definitely a woman. I am here to seduce you into a love of life. I had a terrible mother, emotionally distant, depressed, who abandoned me and my brother by committing suicide when I was 13 years of age. 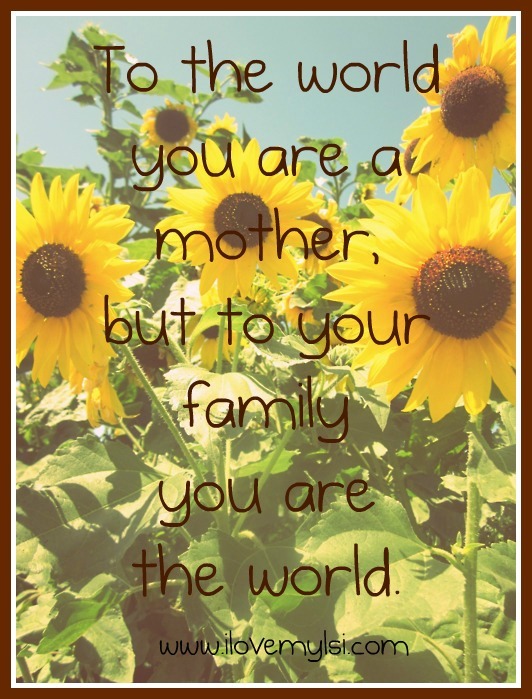 However, I am now a mother of a 22 year old daughter, who has turned out to be a beautiful woman both inside and out, and I think I have been and am a wonderful mom, despite my past experience. Life can get better.